Back when my skincare purchases were based on flashy claims on packaging, Eucerin’s DermoPURIFYER white and green clinical boxes with simple promises did little to entice me, so I ignored them. Oh how wrong I was! I’ve found the products in this range to be simple, effective and cost efficient. Their website is a treasure trove of useful scientific information about the skin and the ways we can keep it healthy. I bought my first Eucerin product mid 2014, and without realising I mistakenly attributed my skin issues from another product to it. Unsure of what to do next I contacted Eucerin through a form for a refund offer that after I filled out I realised had expired. So I threw the receipt away and forgot all about it as in the UK you can only return an item if its faulty, not if it doesn’t work for you. Some places let you, but it isn’t common practice. A few months later I was contacted by a Customer Service rep who apologised for the delay, explained the refund offer was no longer valid but that they would honour it with a gift voucher even though I had no receipt. 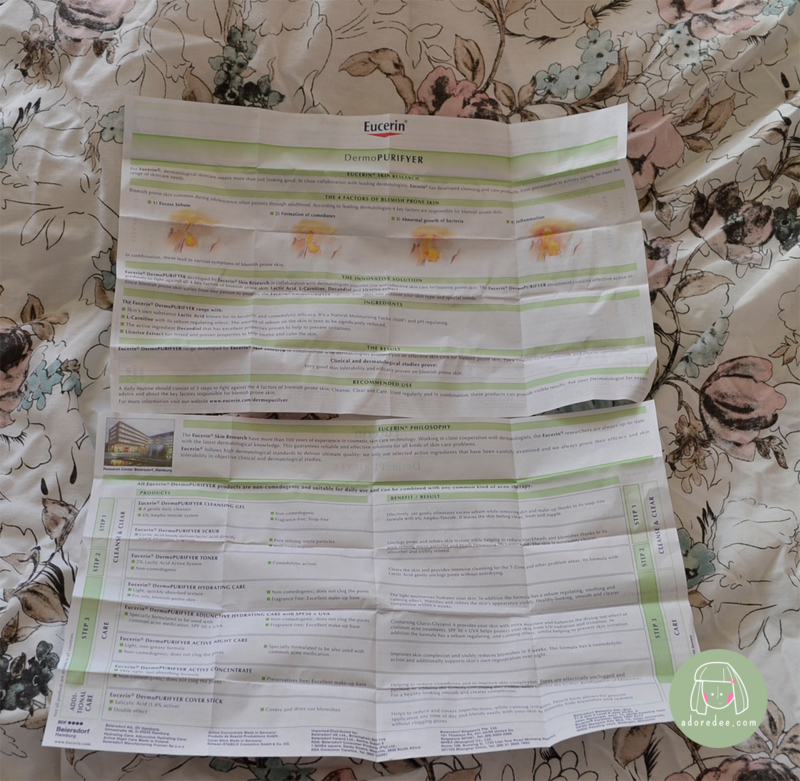 Within one week of returning the product at no cost to myself, Eucerin sent back a gift voucher of slightly above cost for Eucerin and their sister brands that could be redeemed everywhere and personalised letter of heartfelt apologises. At no point in the process did they blame me, make me feel bad. Sure they lost out a little on my first sale, but due to their care of service I felt compelled to try them once more and now I’m a fan. More importantly my whole family is a fan. GET IT Eucerin! The DermoPURIFYER range is for oily and blemish prone skin and has eight products. I’ve tried five of them and even though right now I don’t have any as a staple in my routine, I wholeheartedly recommend this range. The range was created in 1999 and you can read more about it here. Aqua, Sodium Cocoamphoacetate, Propylene Glycol, Sodium Laureth Sulfate, Sodium Chloride, Citric Acid, Sodium Benzoate, Salicylic Acid. Be pH 5.5, don’t break me out and ensure my face is dirt and makeup free is all I ask from my cleansers. This is exactly that. No frills, no fuss. However, because my skin hates SLS I can no longer use it. If this is easily accessible to you, and your skin has no problem with any of the ingredients I’d highly recommend it. It doesn’t leave my skin feeling tight and stripped, just gently cleaned. It also doesn’t foam up a lot, which is great for me as it makes it easy to clean off! It also removes my oil cleanser off completely. Remember when I said. “Be pH 5.5, don’t break me out and ensure my face is dirt and makeup free is all I ask from my cleansers.” Well, I forgot this one other thing, don’t have Polyethylene. Microbeads are just awful for the environment, they are hard to filter out of the water and they are destructive to sea life. When I bought the toner, I bought it as a gentle morning exfoliator. Reading more about how Lactic Acid works, I read that at 2% or less, Lactic Acid performs, pH regulating, antimicrobial, and moisture binding functions. Although this product is not a chemical exfoliator it is still useful as a hydrating antimicrobial product. Weirdly enough, during the autumn my skin absolutely loved this product, but the colder it got the more my skin felt greasy and oily as soon as I applied this. By summer using this became almost impossible and so I dropped it from my routine. My mother on the other hand, loves this product so much. She has dry skin, so the moisture binding function is absolutely perfect for her. She goes through this stuff like water, unlike me, she isn’t precious with any product! Aqua, Glycerin, C12-15 Alkyl Benzoate, Butyl Methoxydibenzoylmethane (UVA), Octocrylene (UVA & UVB), Cetearyl Alcohol, Phenylbenzimidazole Sulfonic Acid (UVB, minimal UVA), Tapioca Starch, Bis-Ethylhexyloxyphenol Methoxyphenyl Triazine (UVA & UVB), Glyceryl Glucoside, Carnitine, Cyclomethicone, Dimethicone, Butylene Glycol, Glycyrrhiza Inflata Root Extract, Decylene Glycol, Chondrus Crispus, Sodium Chloride, Sodium Stearoyl Glutamate, Sodium Acrylates/C10-30 Alkyl Acrylate Crosspolymer, Trisodium EDTA, Phenoxyethanol, Methylparaben, Benzoic Acid. This was the product I thought was hurting my skin so I was really wary when I bought it again. Thankfully, I’ve found nothing but positive things to say about this product. It applies well, and dries matte clear with no sticky residue. Unfortunately for me, this is way too heavy for the summer months, but my brother loves it so he’s using it now. My mother is a fan too, I guess everyone except for me eh? The sunscreen ingredients are chemical not physical, which may be irritating to some people and to get effective initial protection you have to wait 20 minutes before sun exposure. For the UK winters this is all the protection I use, obviously if you want higher protection you should use a separate sunscreen. To get continuous protection, you’ll need to reapply 1/4 teaspoon of the product every two hours. While I’ve loved and lost with the other products I tried, I think this one was a dud from the moment I opened the package. As the others worked so well (for a time), I held out hope that this would work and just kept on believing. I even got others to try it (spoilers, they hated it too – sorry cousin!) and after a few months of holding on to the almost full tube, I threw it away. What was wrong with it? Well everything. It was just a thick cream that felt generally unpleasant. It didn’t sink in well, it didn’t really moisturise well, and it felt heavy on my skin. Nope. nope nope. Would I recommend this range? I put this in the same category as Hada Labo relatively boring products, priced competitively that work. Although I’ve moved on from this brand, I’m glad I started using it because it helped me understand what I like best and what I want in my routine without breaking the bank. My mother and my brother still use Eucerin products, so win for them! My standout product from this range is the Eucerin DermoPURIFYER Cleanser. Although I can’t use it, it’s a solid cleanser, decently priced, good packaging and cleans well. You can purchase Eucerin from a number of online retailers, but I bought mine at Boots during their 3 for 2 skincare sales, and still do for my family members. Previous Post Interview with Amy from peepingpomeranian. Ooooh, that’s some good customer service, always a plus! These products seem like really solid options for basic skincare, too!